Ellie Goulding is said to have split from dubstep star Skrillex, with the pair said to be reportedly blaming distance on not being able to make their relationship work. Brit singer Goulding was with Sonny Moore aka Skrillex for seven months but apparently they didn't find enough time for each other. The pair got together after the dubstep producer emailed the 25-year-old singer to tell her he was a fan of her music. Goulding's new album Halcyon was released earlier this month and the singer revealed how the new album is unintentionally based on her break-up with Radio One DJ, Greg James. So will her third album now be based on this split?! The couple, who met when they worked together on his 'Bangarang' EP, have been dating for around six months and got together after she split from Radio 1 DJ Greg James. Discussing her relationship in April of this year, Ellie confirmed her intention to move across the Atlantic. "I scarily love LA a lot so I’m thinking about moving here," she told The Sun. Muse - The 2nd Law. 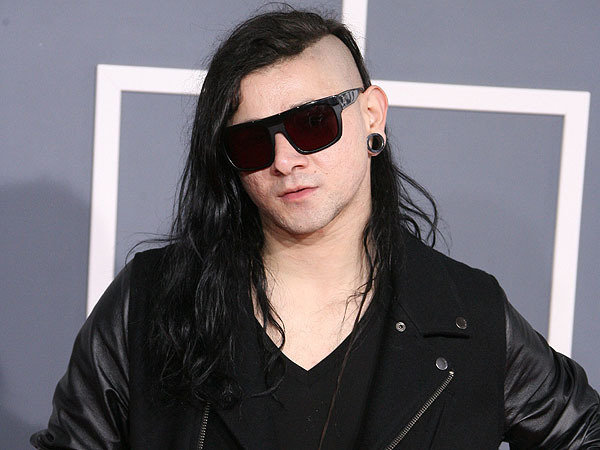 Things were much simpler when Skrillex was called Sonny Moore and making largely ignored emo as part of the band From First To Last. Now he abuses turntables for a living and releases audio of the poor things screaming. Cher Lloyd's 'Swagger Jagger' is not the worst pop song to use a dubstep breakdown but it's certainly up there. Cypress Hill teamed up with Rusko in 2011 and are due to release an EP later in the year. You can hear the results above, were they smoking something? Being 100% robot the dubstep sound kind of suits Britney Spears but this is still not a great example of blending pop and dub seamlessly. Rita Ora's 'RIP' is one of the biggest singles of 2012 but, with a production credit for Chase & Status as well as writing credit for Drake and a Tinie Tempah guest verse it's more of a patchwork quilt of 'cool' than a real song. Foo Fighters, you're a great rock band but please, leave the dubstep alone! Who knew that 'Sweet Disposition' stars The Temper Trap were secret bassheads? We wish we still didn't know. A third and final appearance from Skrillex now, recruiting girlfriend Ellie Goulding here. We do hope fans of her twee Elton John covers don't discover this by accident.